Arthur Foote II, minister for 25 years of Unity Church in St. Paul, Minnesota, carried forth in our time the family heritage of ministry through music. His uncle, Arthur Foote, a noted musician, was a composer, a teacher, and a founder of the American Guild of Organists. His father, Henry Wilder Foote, was both a minister and a hymnologist. He wrote the classic study, Three Centuries of American Hymnody, as well as the definitive studies of both Unitarian and Universalist Hymn Writers and Hymns. With good reason, he eminently served as co-editor of a precious work entitled Hymns of the Spirit, first published in 1937. 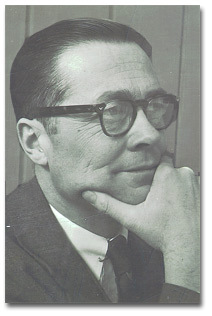 His son, Arthur II, served as Chairman of the Unitarian Universalist Hymnbook Commission, which produced the sequel volume, Hymns for the Celebration of Life, in 1964. 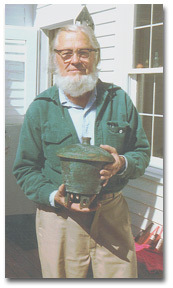 Arthur Foote in 1974 with a piece of his pottery. But it’s been clear to me from talking with so many of you who knew him that Arthur Foote was quite remarkable, both as man and minister. It’s not that he was SuperPastor, or excelled at every facet of this multifaceted job. He hated fund raising, disliked administration, and supported the religious education of children mostly from a distance. Still, so many stories and memories you’ve shared with me testify to a warmth, authenticity, and empathy about the man that have reminded me of the special kinds of opportunities and privileges with which this profession of parish ministry is entrusted. We all hope to live in such a way that those who knew us will speak kindly of us when we are gone, though we never get to hear it. It’s too bad that we can’t somehow be allowed to get an advance screening of our eulogies, so we’ll know that when people told us how much they appreciated and loved us, they really weren’t kidding. Boy, they just don’t make parishioners like that any more! They don’t make many ministers like that anymore, either. You who have shared your still-warm stories with me were lucky to have had Arthur Foote for your minister—I suppose the proper word is “blessed.” This church was also blessed, and those blessings linger in the form of old tales, wet-eyed memories, funny and poignant stories of a man whom Jews would call a real Mensch, and whom you got to call the Rev. Arthur Foote II. HOME ADDRESS: 764 Goodrich Ave., St. Paul, Minn.
OFFICE ADDRESS: Unity Church, 73 Holly Ave., St. Paul, Minn.
BORN: Jan. 18, Hi, Ann Arbor, Mich. PARENTS: Henry Wilder Foote, ’97, Eleanor Tyson Cope. PREPARED AT: Belmont Hill School, Belmont, Mass. YEARS IN COLLEGE: 1929 – 1933. DEGREES: A.B., 1933; B.D. (Meadville Theological School), 1936; D.D. (ibid. ), 1956. MARRIED: Rebecca Carroll Clark, Aug. 6, 1933, Southwest Harbor, Maine. CHILDREN: Frances Eliot, Nov. 17, 1937; Nathan Clark, March 2, 1940; Caleb, Nov. 3, 1943. HARVARD BROTHERS: Wilder Foote, ’27; Caleb Foote, ’39. OCCUPATION: Unitarian minister; minister of Unity Church, since 1945. OFFICES HELD: Member, Governor’s Advisory Council on Mental Health, 1948-53; president, St. Paul Council of Human Relations, 1949-50; vice-president, Minnesota Association for Mental Health, 1953-56, Minnesota Welfare Conference, since 1957; member board of directors, American Unitarian Association, 1954-57; co-chairman, Unitarian Universalist Hymnbook Commission, since 1956; president, Minnesota Council of Liberal Churches, since 1957. PUBLICATIONS: Taking Down the Defenses, Beacon Press, 1954; also various magazine articles. When I decided, midway in my senior year, to enter our Unitarian Theological School in Chicago, I was not at all sure that the ministry would prove “my dish.” More than one college-mate took me aside to assure me that with my stammer it was bound to be a mistake; and I guess only cussedness kept me from agreeing. During the summer I had other things (I mean another person) to think about: Becca and I were married August 6, 1933. Arthur Foote at Harvard College. Once at Meadville, my inner doubts vanished. With a clear goal before me, I at last found studies that captured my total interest. We had many wonderful experiences during the next three years. To mention one, my student charge in Shelbyville, Illinois, whither we drove each Friday for a long weekend. The lay leader of this tiny parish was Winifred Douthit, an extraordinary and unforgettable character, a hunchback scarcely three feet tall and the best critic of sermons I’ve ever had the good fortune to meet. My Sunday afternoon course in Homiletics was worth any three at the school. Graduating in March, 1936, Becca and I set sail for Europe, well loaded with letters of introduction to Unitarian leaders in Romania, Hungary, Czechoslovakia, Holland, England and Ireland. Traveling by car, we had five jam-packed exciting months. Agreeing 100% with Horace Greeley’s advice, on our return to the States in September, we headed for the West Coast. The assignment, to resuscitate two moribund churches. Sacramento, after a doleful history of misunderstanding, had ceased operation three years earlier. Of its supposed membership of ninety-eight, I could find only a handful still interested—and they were pessimistic of the possibility of reopening. Stockton, forty-five miles to the south, was in bad shape also, its membership dwindled to thirty-three. The discouragements and heartbreaks of those depression years in California have long since slipped into the background of my mind. Only the resiliency of youth saw us through. We stayed with this dual assignment nine years, the last five of them looking steadily brighter (in spite of wartime worries and tensions). When feelers came from one of the strongest of our middle-western churches, I found myself loth to leave. But I knew the two churches had grown to the point of needing a minister apiece, and that meant I’d worked myself out of a job. So my apprenticeship came to an end. In the spring of 1945 the Foote family packed up and trekked to St. Paul. We brought Fran aged seven, Nathan, five, and Caleb, eighteen months. The baby was suffering from some undiagnosed ailment, and the doctors seemed unable to reverse his malnutrition. Probably only our move to St. Paul, with its fine Children’s Hospital, saved his life. That was twelve years ago. So full have these years been it is difficult even to summarize. They have seen Fran become a high school graduate and now a licensed practical nurse; Nathan, a senior at St. Paul Academy holding more than his share of honors, including the co-captaincy of Minnesota’s Independent School League champion football team, and a hopeful applicant to the old alma mater; and Caleb, a sturdy teenager, a wiry, left halfback on the Second Form team. Not surprisingly, they have seen Papa and Momma grow a little grey around the temples. They have seen the church more than double in size, and add a fine new wing to its parish house. They have seen many exciting chapters in the mental hospital reform in the State, spark-plugged by an aggressive Unitarian Committee. And they have seen the manually clumsy parson become a handyman with hammer and saw. Several childhood chums have been amazed when they have visited us in “The Dinghy,” our summer cabin on the rockribbed shores at So’west Harbor, Maine, built by your correspondent, and his wonderful wife and kids. If the foregoing sounds more than a mite pollyannish, my only defense is that it is written by a happy man, who has found the struggle to become a mature person challenging, the work of the ministry rewarding, and the role of husband and father both. DEGREES: A.B., 1933; B.D. (Meadville Theological School), 1936; D.D. (Meadville Theological School), 1936. MARRIED: Rebecca Carroll Clark, 1933, Southwest Harbor, Maine. CHILDREN: Frances Eliot Foote, 1937, m. Carl J. Stehman, Jr.; Nathan Clark, 1940 (Harvard ’62), m. Wily de Broen; Caleb, 1943 (Harvard ’66), m. Susan Bartlett. OCCUPATION: Retired Unitarian Universalist Minister, Unity Church, St. Paul, Minn.
HOME ADDRESS: P.O. Box 574, Southwest Harbor, Maine 04679. 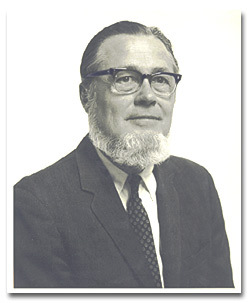 OFFICES HELD, HONORS AND AWARDS: Chairman of the Board of Trustees, Meadville/Lombard Theological School, 1960-1963; Chairman of the Commission, Unitarian Universalist Assoc. PRINCIPAL WORKS: Taking Down the Defenses, Beacon Press, 1975; Hymns for the Celebration of Life, Beacon Press, 1964. Finishing a twenty-five-year pastorate in Saint Paul in 1970, Rebecca and I decided to return to Southwest Harbor, her native and my adopted home, to enjoy our elective years. Our quarter-century in Minnesota was personally furfilling, but we were ready for a change of scene and occupation. A childhood visit to a famous old Italian pottery had left me with an itch to try my hand at turning lumps of clay into objects of usefulness and beauty. At the Saint Paul Art Center, I learned all I could about this craft, and now, for a dozen years, I have practiced this second career as a stoneware potter. It has proved immensely satisfying. First, we renovated my wife’s ancestral home, one of our town’s oldest, adding some modern conveniences and a studio wing. The house was built by her great-great-grandfather, Captain Nathan Clark, and looks out over our charming harbor. Besides throwing pots, I keep as busy as I want to be with occasional preaching, growing vegetables, chopping wood for our three stoves, hiking, reading, trying to learn how to play the piano, and enjoying old (and not so old) friends who drop in on us—especially our children and grandchildren when they make it back to Maine. We travel a little, but not too much; it’s too nice right here. Our proximity to Acadia National Park adds much to our enjoyment of life; and after many urban years we are glad for the slower, quiet life of a Maine village (slower and quiet, that is, except during the tourist season). Our blessings are many, and we enjoy counting them. 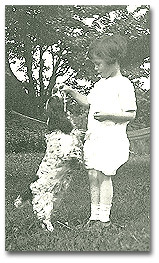 Arthur at age 4. Courtesy of Frances Eliot Foote Stehman. 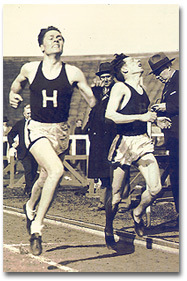 Arthur, at left, competing at Harvard. Courtesy of Frances Eliot Foote Stehman. 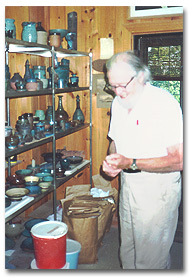 Arthur in his pottery studio. Courtesy of Frances Eliot Foote Stehman. Foote, Arthur II. Hymns for the Celebration of Life. Boston: Beacon Press, 1954. Foote, Arthur II. Taking Down the Defenses; A Lenten Manual. Boston: Beacon Press, 1954.